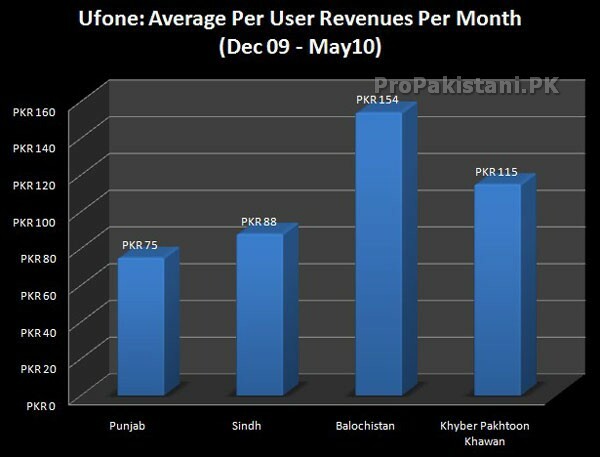 Ufone has earned an average of Rs. 1.19 for each outgoing minute on its network during last six months, revealed a report exclusively made available by highly reliable source that wanted to remain unnamed. We are giving selected details from the said report to give our readers an idea about outgoing traffic and total voice revenues of Ufone. In last six months, Punjab naturally contributed highest share of outgoing voice traffic, i.e. 54 percent followed by Sindh that shared 28 percent. Khyber Pakhtoon Khawan generated 13 percent of total voice traffic for Ufone with Balochistan standing last with 5 percent traffic share. Following Graph Shows average revenue generated for one outgoing minute. It varies in different provinces because of different selection of tariff plans in different regions. Note: Revenues’ details are for Voice traffic only. It does not include SMS, GPRS and other details. We are trying to get hold of similar information for other operators as well. We will continue this series as we get required information. so what’s the point? I mean, will these figures make us the developed country? So should I think that, from now on I should proud myself just because Ufone and other bloody networks are ruining my Pakistan’s young generation by SMS Bunldles and Voice Packages (specially Late Night) and LHC and others just watch…? Damn…!!! What is the motive behind this??? If some one leak out your pay and your home arrears what will you feel then ? You should have a little ethical posts. I think some body else is posting with Aaamir Aata name. we have not mentioned exact figures, instead gave relative information – to avoid comments like yours. what is average data of Azad Kashmir???? why its not mentioned??? Amazing data. So much is explained by these figures. Thanks ProPakistani and amazing job. ProPakistani has lost its ethics…. Why disclosing the details which are for business use to general users. I wonder what will happen if someone took photos of Administrator and his / her family with all persona details and publish online. (I am sorry I quotted this example but please show some respect for privacy and ethics). Running a popular site is a responsibility please consider this request positively. did you find any personal information in up-given stats? Did we ever cover any personal scandal? These are corporations, let’s not take them as individuals with personal lives. You may need to look at global standards to get acquaintance of what you have just seen. Admin, Then I thing there is no harm for you to share the resource who leaked the information. Please don’t take it personally, This whole post you can re-write with abstract information w/o mentioning the stats. That is better news and it also take privacy of parties into consideration. ProPak provides very useful information and as a fan I was curious that it should be with the aim of betterment not to damage a repute of some person, institute or laws. Thanks for taking time and consideration of my request. Can you tell us, what is your profession? Aurehgzedb, grow up buddy. There is nothing unethical in publishing this data. I do not understand why are you mixing two altogetehr seperate issues. This is a company whose subscribers stats are given on a web site which hosts news about telecom/it and what is wrong in that. Please give some logical reasoning if you feel this is wrong. What is the rationale behind your logic. – And about publishing news which are unknown to external world – this is what media is all about, that’s why you come to this website or any other news website. Absolutely news like PTCL puts installation charges, Zong packages, new tariffs, hidden costs and other new stuff lot to know. There is nothing wrong in putting news like this as well..but it should permit the statistical data / revenue data of a business not to be publicly disclosed. Even mentioning Percentage breakdowns is good, but figures in Rs. is little beyound the line I guess. One more thing as you must be aware of that Govt. to sanction PTA an Internet Content Filtering Authority. Right now ICFA goals were about to be formed. If releasing business data which may hurt or create disclosure of Business Data w/o permission of the source company, Telco. Companies collaboratively can put formal request to ICFA to moderate / action against such sites. I just want site like ProPakistani to avoid to be in such situations. An end user need not be concerned about the revenues of the service provider. such data may not harm someone’s personal privacy but it does harm company interests. You are right. However, if the data is that confidential, the company should take measures to ensure that it’s not leaked. If the company and it’s employees can’t keep the secrecy of data, then other can’t be blamed for publishing it. Beside this, I personally think companies must disclose their detailed information to industry and people. However, in our society, sharing information is considered as it’ll harm them and will take away their competitive advantage. Which is just a lame excuse. Majority of the bigger companies give full disclosure and yet they are still ahead of many. Altaf… Companies take many precautionary measures. But companies are operated by people. In large corporation there are many people involve in the hirarchy of decision making. Even sometimes a remorse or some hidden agenda like screwing a coworker is behind leaking the information. e.g U and Me work in same company may be different departments and somehow we were not getting along. I may leak something which was primarily your job related to present u as bad. Or may be someone promise me to provide some Juicy Data and in return a gift like mobile phone will be mine :). So you will find individuals like this everywhere. Regarding sharing data, There is monthly or quarterly report regarding how these telecom companies are doing is been published by PTA and usually find its links in ProPakistani. There is no harm in that data. Right now the competition for telco. companies is fierce in Pakistan. Data revealing cost / profit ratios and revenues information. Other telco. companies may use this data as comparison and kills the competition as they now have internal knowledge how there competitor is performing and how reduce call rates they can offer or any other strategical decision.